That’s our motto! DashThis helps businesses and agencies track their performance results by saving them time so that they can focus on creating value instead of gathering data across multiple platforms by hand. With our tool, you get your data in one beautiful and easy-to-understand performance dashboard. Plus, if you need help along the way or just want advice on the best practices, our dedicated account managers are here for you. Simple as that. Choose from many of our integrations: Google Analytics, AdWords, Facebook, Twitter, MailChimp… see the data that matters most to you! Want to upload your own custom data and include it in your dashboard too? Just upload whatever data you need with a CSV file, and we take care of the rest. 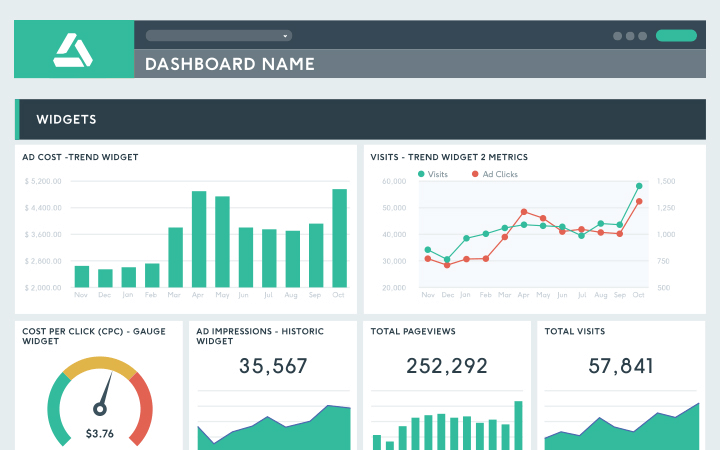 Add your logo, set your targets, include comment boxes, images, and titles... Really make your dashboard your own! No matter the plan you choose, all this customization power is included! And if you want even more customization with a fully white labeled performance dashboard? We will take care of it! See our white label options. Access your dashboard from anywhere via a distinct URL. If you prefer, download a PDF version so you can either send it or print it. You can also set up an automatic email dispatch to your employees, coworkers, or clients. No matter what, you’ll be sure your data is visible, shareable, and actionable! We support major web-based tools such as Google Analytics, Google Adwords, Facebook, Twitter, MailChimp, and many more. You can also upload your own custom data using CSV files! Basically, there’s no end to the data you can include in your dashboards! Most dashboard solutions offer pretty much the same features. But we aren’t like the others. Along with the regular features, we believe that our tool should be simple and accompanied by awesome customer support for every single user that crosses our path. If you need help or if you have a question about our dashboards, don't hesitate to reach out! We’re here to make sure you not only get the best dashboard, but also the best experience. At DashThis, people come for the tool and stay for the people. Here are a couple of our happy clients. Customization, simplicity, and scalability. It’s not rocket science. Our goal is for you to get your dashboards up and running without the pain and confusion you might get with the more complicated tools out there. Take a look at all the features we’ve put our heart and soul into to ensure that you can enjoy a better dashboarding experience. We believe you should only pay for what you need. So that’s exactly how our pricing system was designed: pay for the number of dashboards you need. Plus, no matter the plan you choose, you’ll always get the best customer support in the business. Also, if you need more dashboards than what you find in our regular plans, we’ll make a custom plan just for you. Save on a custom URL and design with a white label bundle that includes both! A performance dashboard just the way you want! Traffic, Time on Site, CTR, Conversion Path, Bounce Rate… Your clients’ websites undoubtedly involve a whole lot of data you need to constantly keep track of. With a Google Analytics dashboard template, gather all your clients’ website data in a single, nice-looking Google Analytics report for your client and start reporting in no time!